Genesis 12:1-3 1Now the LORD said to Abram, “Go from your country and your kindred and your father’s house to the land that I will show you. 2And I will make of you a great nation, and I will bless you and make your name great, so that you will be a blessing. 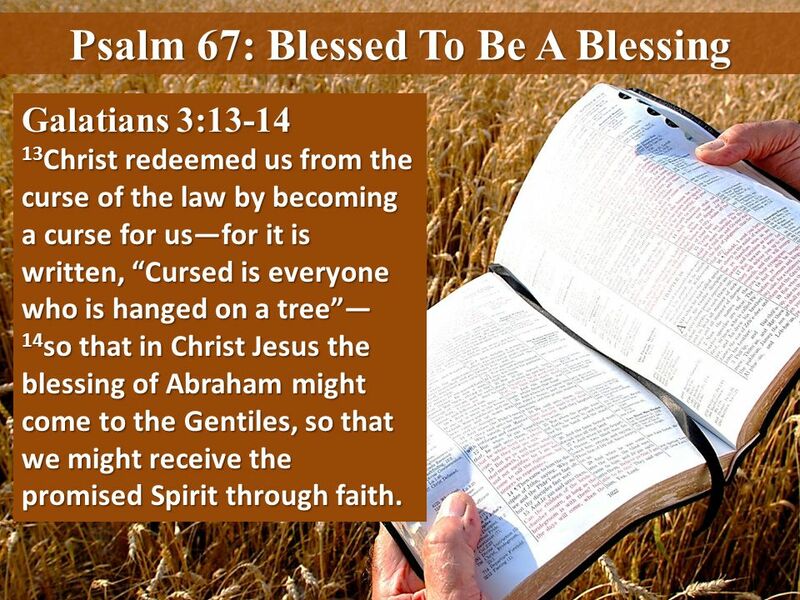 Galatians 3:10-14 13Christ redeemed us from the curse of the law by becoming a curse for us—for it is written, “Cursed is everyone who is hanged on a tree”— 14so that in Christ Jesus the blessing of Abraham might come to the Gentiles, so that we might receive the promised Spirit through faith. 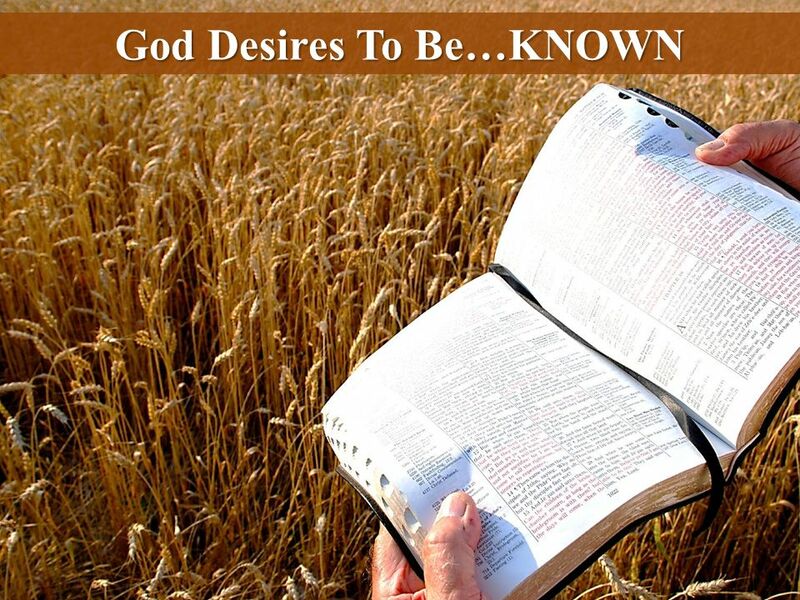 Psalm 67:2 2…that your way may be KNOWN on earth, your saving power among all nations. Psalm 67:3,5 3Let the peoples praise you, O God; let all the peoples praise you! Psalm 67:3,5 5Let the peoples praise you, O God; let all the peoples praise you! Psalm 67:7 7God shall bless us; let all the ends of the earth fear him! 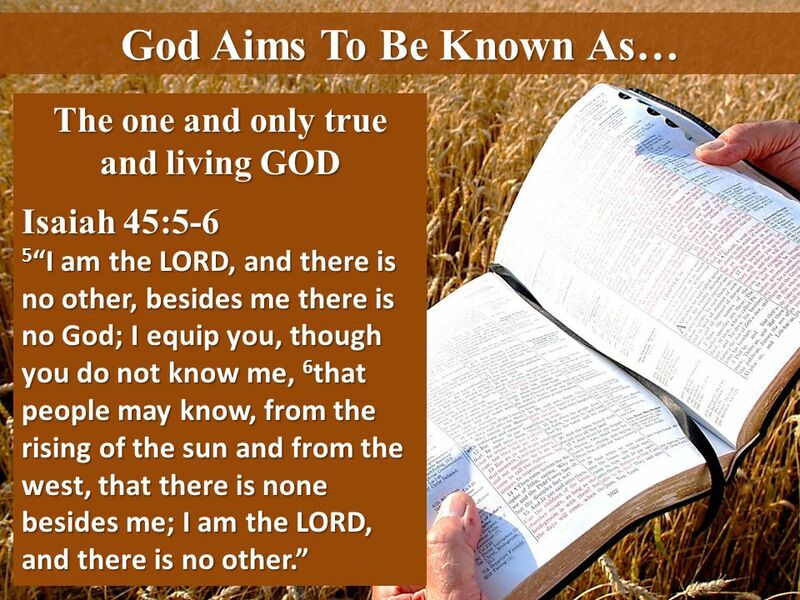 God Aims To Be Known As… The one and only true and living GOD Psalm 67:3 3Let the peoples praise you, O God; let all the peoples praise you! 19For as by the one man’s disobedience the many were made sinners, so by the one man’s obedience the many will be made righteous. 4…for you judge the peoples with equity and guide the nations upon earth. 1The king’s heart is a stream of water in the hand of the LORD; he turns it wherever he will. 1May God be gracious to us and bless us and make his face to shine upon us, 2that your way may be known on earth, your saving power among all nations. 6The earth has yielded its increase; God, our God, shall bless us. 7God shall bless us; let all the ends of the earth fear him! 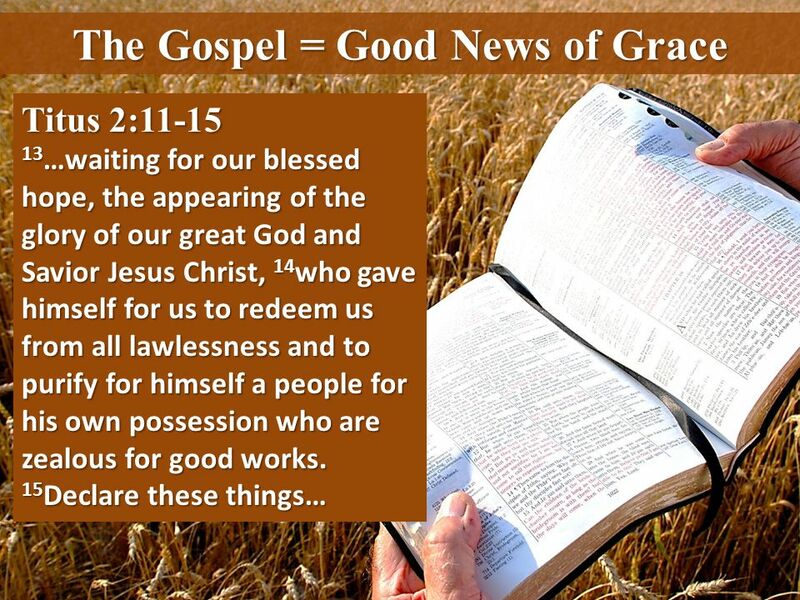 Galatians 3:13-14 13Christ redeemed us from the curse of the law by becoming a curse for us—for it is written, “Cursed is everyone who is hanged on a tree”— 14so that in Christ Jesus the blessing of Abraham might come to the Gentiles, so that we might receive the promised Spirit through faith. Galatians 3:6-9 6…just as Abraham “believed God, and it was counted to him as righteousness”? 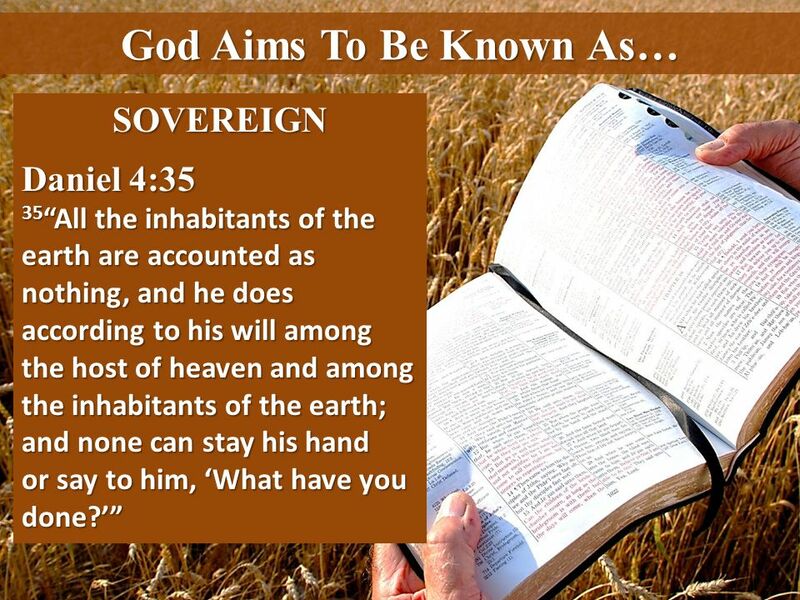 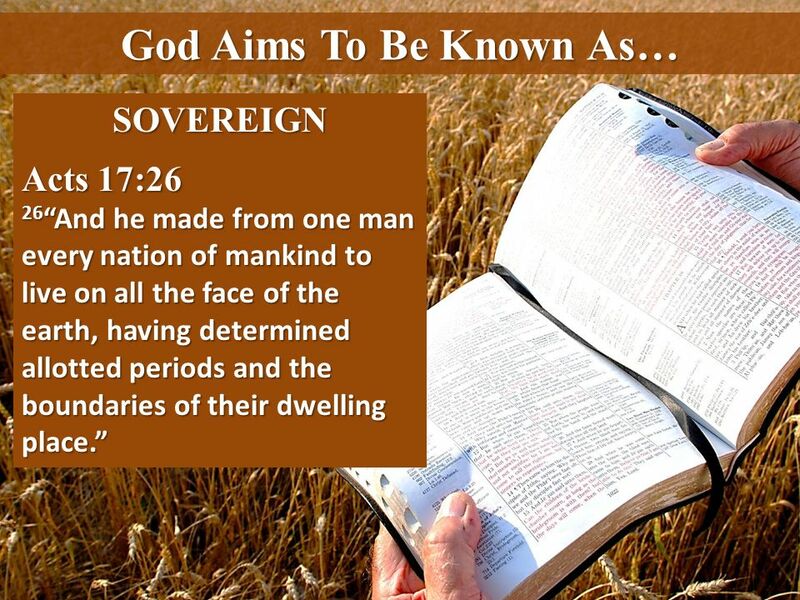 7Know then that it is those of faith who are the sons of Abraham. 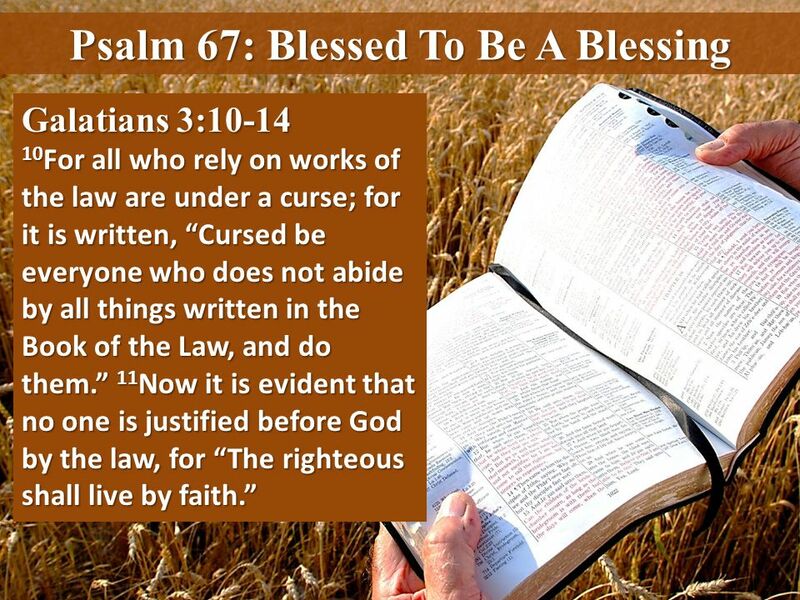 Galatians 3:6-9 8And the Scripture, foreseeing that God would justify the Gentiles by faith, preached the gospel beforehand to Abraham, saying, “In you shall all the nations be blessed.” 9So then, those who are of faith are blessed along with Abraham, the man of faith. Galatians 3:26-29 26…for in Christ Jesus you are all sons of God, through faith. 27For as many of you as were baptized into Christ have put on Christ. 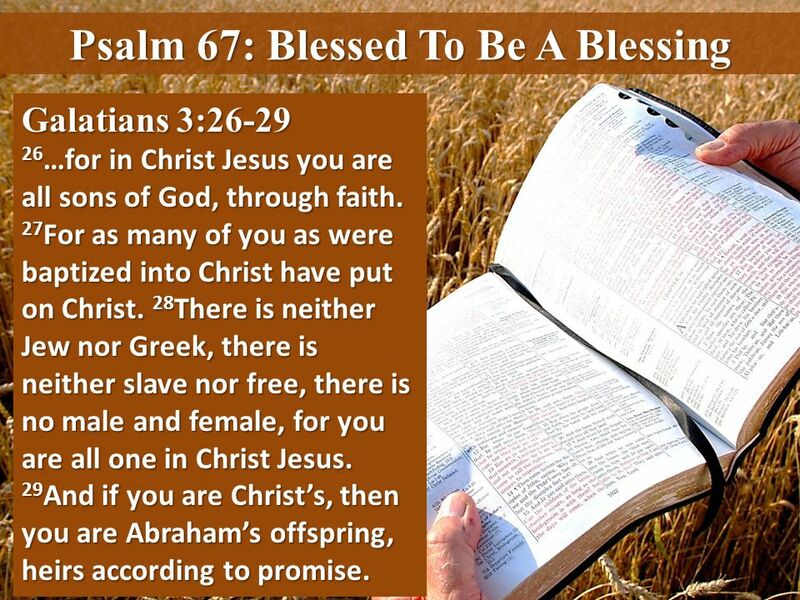 28There is neither Jew nor Greek, there is neither slave nor free, there is no male and female, for you are all one in Christ Jesus. 29And if you are Christ’s, then you are Abraham’s offspring, heirs according to promise. Download ppt "Psalm 43:3-4 3Send out your light and your truth; let them lead me; let them bring me to your holy hill and to your dwelling! 4Then I will go to the altar." 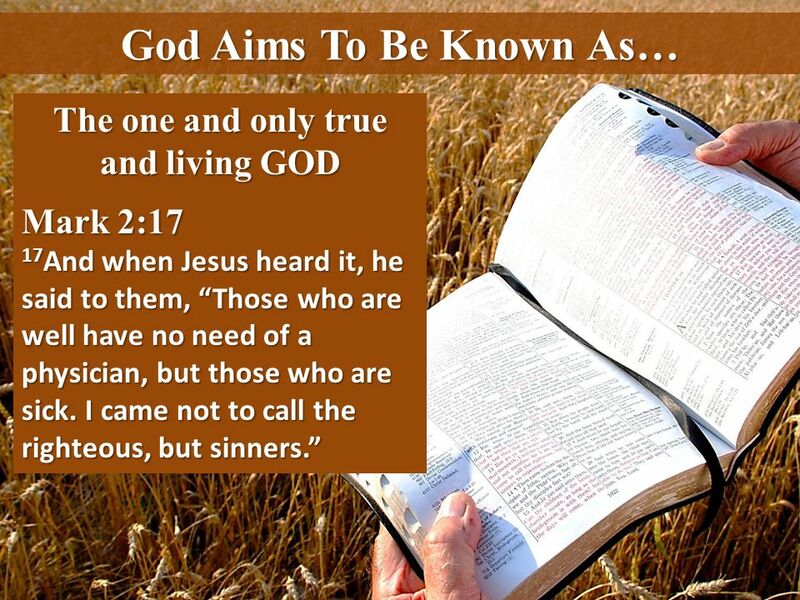 What is so special about Jesus? Brendan Leighton. I have been crucified with Christ; and it is no longer I who live, but Christ lives in me; and the life which I now live in the flesh I live by faith in.